Go no further if you are looking at where to stay in Ubud. Our guide will give you the best accommodation choices ranging from luxury to budget. With so many things to do in Ubud, staying here is a good idea. 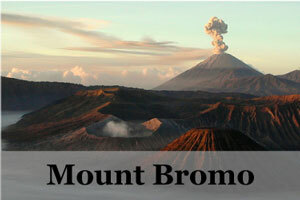 Moreover, its central location helps to easily explore the rest of Bali. A popular boutique hotel located on the hillside in Ubud. 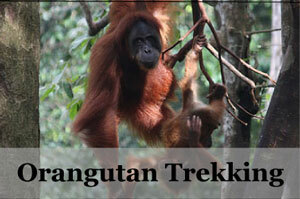 It is far enough from the hustle and bustle of the city but yet close enough to the tourist attractions around. Its villas are nestled within beautiful gardens with private terraces overlooking the valley. 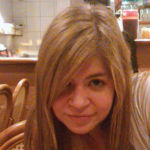 The breakfasts are well loved and the free daily yoga classes are highly rated. This is another popular place to stay in Ubud, as it’s a stylish boutique villa complete with meal and spa facilities. Amidst tropical greeneries and a private pool, you will find modern Balinese inspired villa. Tucked away in Ubud, just 15 minutes walk to the famous Monkey Forest, this affordable villa features eclectic designs with a common theme true to its name. There are trees and greens surrounding the pool and the individual villas. The high ceiling with wood interior is definitely a unique experience itself. Recommended for couple who appreciate unique designs and experiences. 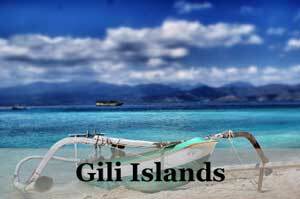 For those who is looking for unpretentious comfort with Balinese charm. Located in Ubud village, our favourite place to stay in Bali, the Balinese style cottages with carved wood furnishings are set in beautiful gardens with a pool. A double room with breakfasts start only from 90 USD. For those who are seeking a mixture of peace and action in the heart of Bali – Ubud. 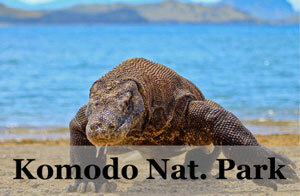 The rooms come with traditional Indonesia architecture and air-condition. There are also a swimming pool, restaurant, Wifi and parking provided. 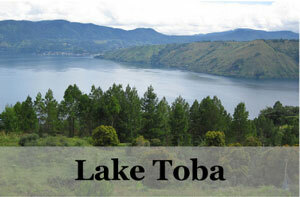 Spirituality is the main vibe in Bali, and Ubud, as the center of Bali, came with few of the best temples in Bali. 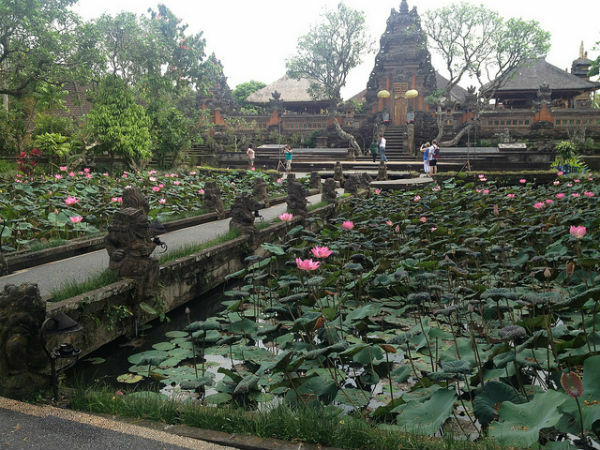 Visiting temples in one of the things to do in Ubud besides the museums, spa, massages, and shopping. The main religions here is Balinese Hinduism and its temple is known as pura. 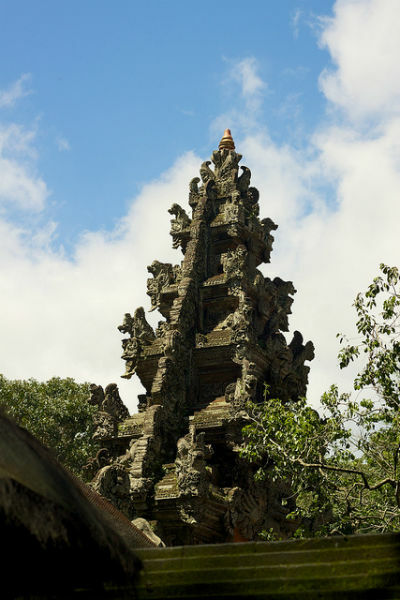 The term pura is originated from the Sansrkit word that means “walled city” or “palace” and has now evolved aptly to mean temple complex in the Balinese language. This temple is built 60 years ago and dedicated to the Goddess of Arts. It is well known for its lotus-filled pond, which is often called the “Lotus Open Pond Stage”. The gardens and pond can be visited during the day but only Hindus are allowed inside the temple. There is also a Cafe Lotus attached where you can slowly soaked in the serenity. This temple hosts a variety of traditional dances on different days and is touted to be one of the best in Bali. 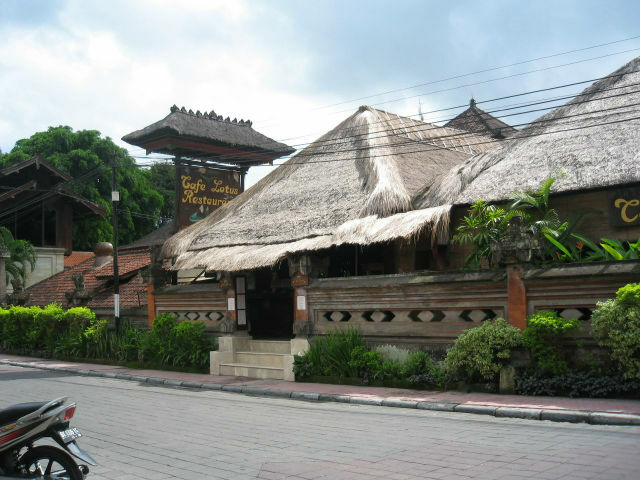 Located in Ubud, this temple can be found at Jl. Kajeng. 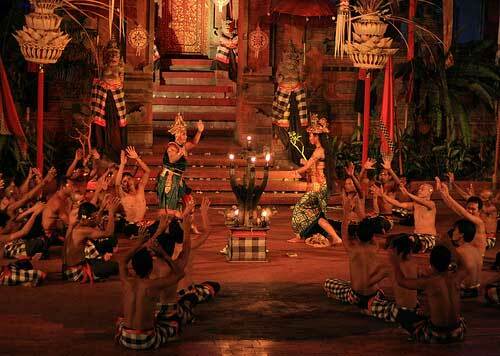 Well-known for its kecak dance, it is touted to be the best place to enjoy this popular dance in Bali. You can find the shows on Mondays and Wednesdays. This temple is located beneath a huge banyan tree and the stairs leading up to it are lit by oil lamps. A truly magical experience going into the temple. Located in Ubud, this temple can be found at Jl. Raya Ubud. 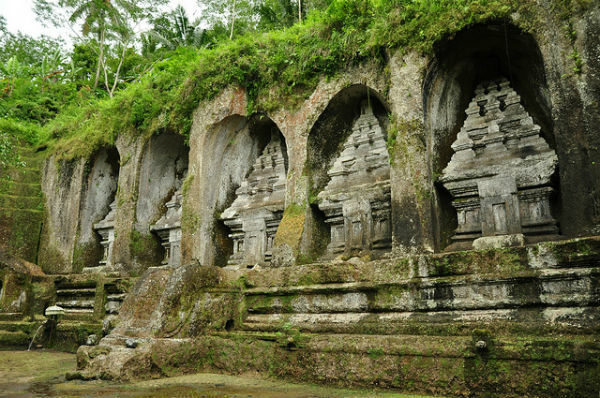 Goa Gajah temple is a temple dated back to the 10th century and is known as the Elephant cave. 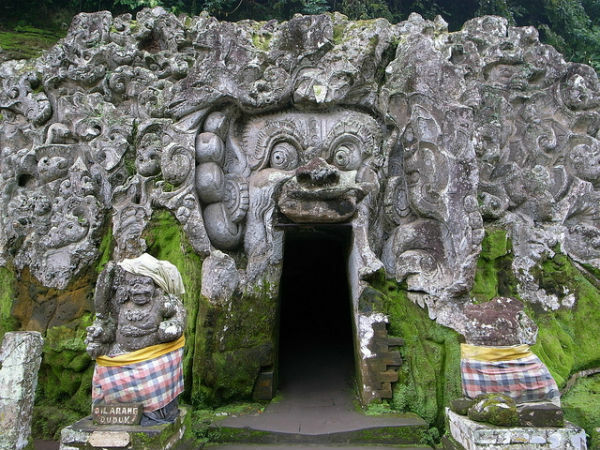 One of its main attractions is its carved entrance of menacing creatures and demons. Inside the cave, you will find statues of the Lord Ganesha (the God with the elephant head). Also within the site are an extensive bathing pools, which are not only excavated until the 1950s. It takes only 10 minutes drive from Ubud city center. 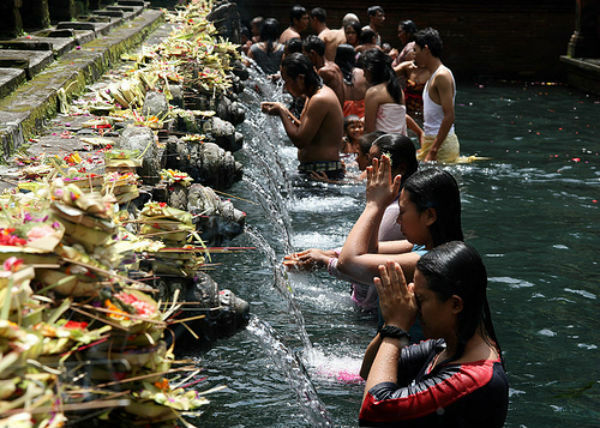 Also known as the water temple in Ubud, Pura Tirta Empul has its own sacred spring water with healing properties. This temple dates back to 926 AD and is well revered by the locals. Many will come and climb up to the temple for a bath and meditation in the long main pool. It is believed to bring good fortune and health. Base on a legend, this spring us created by the God Indra as an antidote to the poisonous spring of an evil demon King. This temple, known as the “valley of the Kings’ is located in the cliffs between rice fields at the south of Tampaksiring, Bali. The Pakerisan river flows through the ravine and flanking the river is the shrines and carved stones that are meant to commemorate the 11th-century kings and queens. Though technically not a temple, it is still revered as a holy place by the locals. This site is more of an actual tomb for the royalties that are cremated here base on Balinese customs. As you can see, Ubud is a strong spiritual center of Bali with its variety of temples worth a visit. 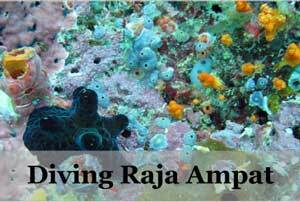 Along with the temples, you will also find shows and festivals that are bound to entertain. When I visited here, I have also chose Ubud as my central place to explore Bali, especially with so many good places to stay. 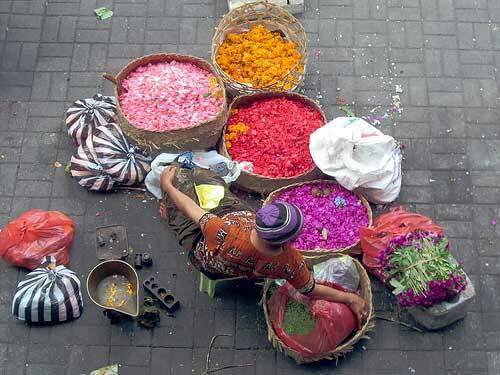 Stay in Ubud for culture, nature, arts and markets. Ubud has plenty of places that tourists will enjoy staying at. There’s the Como Shambhala Estate *, which is a health retreat deep in the rainforest. There’s the Hanging Gardens Ubud *, which has a spectacular view and private pool villas. The Purist Villas & Spa * is another popular place to stay in Ubud, as it’s a stylish boutique villa complete with meal and spa facilities. A popular boutique hotel is Uma by COMO *, which is located on the hillside in Ubud. Ubud is famous for its food, besides culture, and this is one of the best places in Bali to sample a wealth of local Indonesian food. 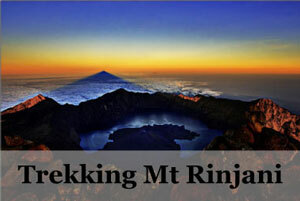 This is why it is also home to some of the best restaurants in Bali. One of the best things about Ubud is the sheer variety of bites on offer and you can spend the day sipping on freshly pressed local juices made with exotic fruits and sampling the street food bought piping hot from carts on street corners. If your appetite and budget allow, then you can also enjoy a variety of fine dining in Bali which are located in Ubud, but there are also, of course, lots of affordable food to be found here. Here are our very own top 10 best restaurants in Ubud. 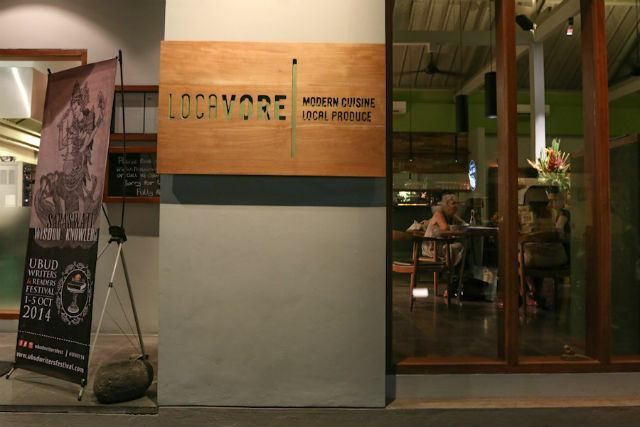 One of the most famous restaurants in Ubud is Locavore which is the brainchild of two chefs called Ray Adriansyah and Eelke Plameijer which has an emphasis on local ingredients. You can select from a variety of tasting menus here including one which features nine courses and is paired with wine, and just some of the highlights include traditional Indonesian oxtail or freshly caught barramundi. Famous Locavore restaurant in Ubud Kabupaten Gianyar, Ubud. Photograph by Indus and the Ubud Writers & Readers Festival. 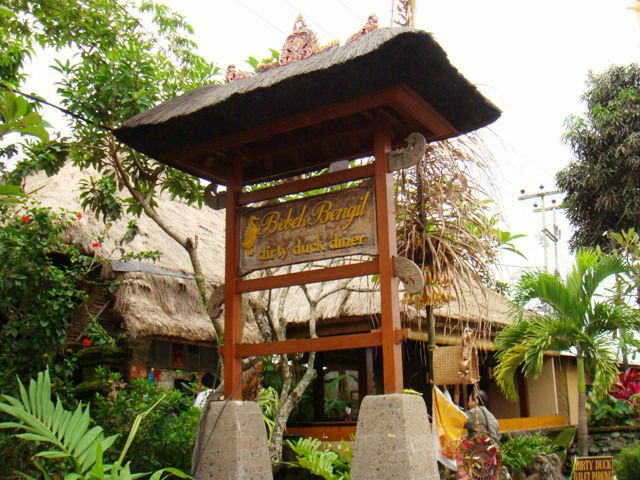 Ibu Oka Warung is one of the most famous spots in town and enjoys a strategic location across from the Royal Palace in Ubud. The reason to come here is for the babi guling which is traditional roast suckling pig. Expect it to be simple but delicious. Basically, you get large slices of roasted pig served with rice and some side vegetables, all of which are accompanied with a delicious spicy sauce. Hujan Locale has made a splash on the Ubud food scene thanks to its delicious Asian cuisine. The restaurant is modeled in the colonial style and menus have headings such as ‘From the farm’ and ‘From the sea’. Some of the delicious plates you can expect here include juicy lamb curries inspired by Yogyakarta and fish curry cooked in the Acehnese style. Bebek Bengil Restaurant translates as the Dirty Duck which is the main feature on the menu. The restaurant has a secret recipe developed in-house in the 1990s and the duck is boiled in a flavorful broth before being massaged with a blend of traditional Balinese herbs and spices. The meat is then fried until it blisters to create some of the most delicious duck on the island. If you want to support the local community while you have your dinner, then consider a trip to Fair Warung Bale. 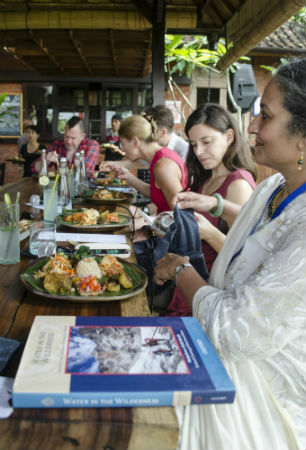 Owned by the Fair Future Foundation, the proceeds of your meal will go to healthcare in the Ubud community. Some of the items you will find on the menu here include toothsome curries as well as some international fare. 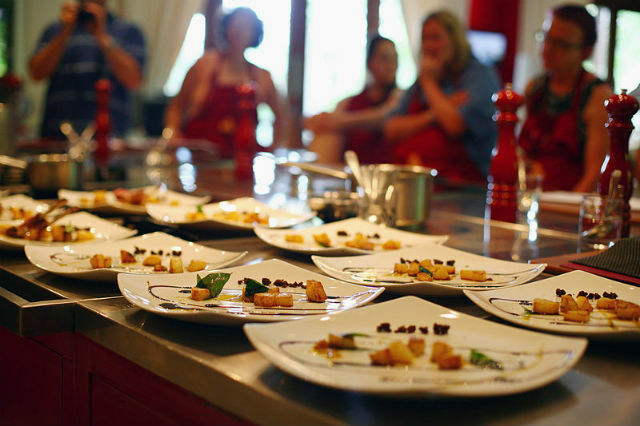 One of the best known upscale restaurants in Ubud is called Mozaic and is known for its French-Indonesian fusion food. All the dishes are the brainchild of Chef Chris Salans and you will find French dishes that have been made with local Balinese ingredients. One of the highlights here is the tasting menu which is made up of local treats like blue fin tuna and other fresh seafood delights from around the region. Cafe Lotus is now actually a chain that exists all over Bali but it started in Ubud in 1982, so if you eat here you will be coming to the source. This restaurant looks out over a pretty lotus pond (hence the name) and you can come here to try the traditional Balinese dishes such as fish rubbed in a spice blend made of lemongrass, galangal, and turmeric which is then wrapped in banana leaves and cooked. CasCades at the Viceroy is one of the most upscale restaurants in Ubud and you will dine in a Balinese pavilion covered with a traditional thatched roof. The restaurant looks over the lovely Petanu Valley and you can choose from French dishes that have an Asian twist. To that end, you will find Balinese, Japanese, and even Thai influences here and there is a tasting menu that comes with scallops, rack of lamb, and a selection of delicious cheeses. If you are a vegetarian or just want to eat more greens, then consider a trip to Moksa. This restaurant is based around a permaculture farm and is focused on simple yet delicious plant based meals. Some of the dishes are raw while some have seen a little eat and you can expect a changing menu with dishes such as vegan pasta made with vegetables and covered in ‘cheese’ made from nuts. Try Moksa restaurant for vegetarian, Ubud. Photo by Xenia Blair and the Ubud Writers & Readers Festival. 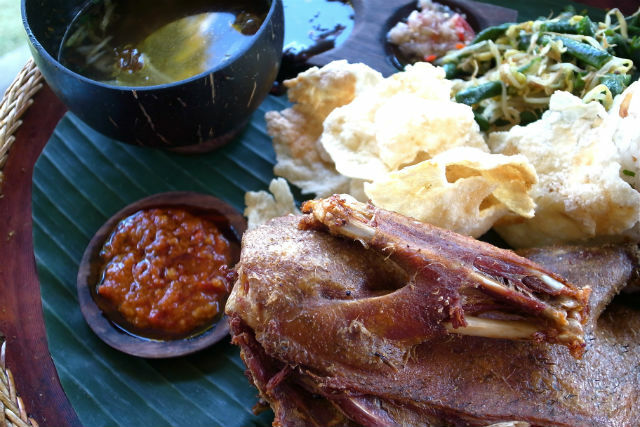 If you are in Ubud then one of the restaurants that you absolutely can’t miss is Bebek Tepi Sawah located at the Tepi Sawah Villas in Peliatan. The name is a reference to the ducks that line the rice terraces here and as a result, you can expect to find plenty of duck on the menu. If you are not a fan of this meat however then you will find plenty of other delicious plates featuring mixed seafood platters as well as delicious pork dishes like braised pork ribs. 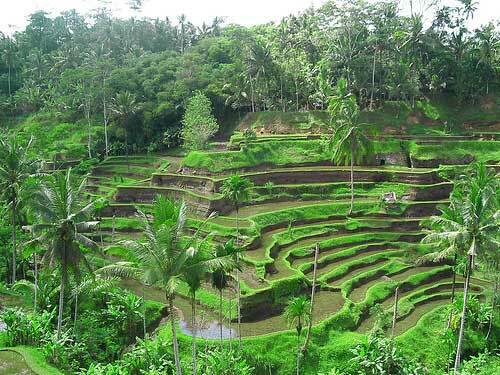 Besides its amazing food scece, stay in Ubud also for its culture, nature, arts and markets. Ubud has plenty of places that tourists will enjoy staying at. There’s the Como Shambhala Estate *, which is a health retreat deep in the rainforest. There’s also the Hanging Gardens Ubud *, which has a spectacular view and private pool villas. The Purist Villas & Spa * is another popular place to stay in Ubud, as it’s a stylish boutique villa complete with meal and spa facilities. A popular boutique hotel is Uma by COMO *, which is located on the hillside in Ubud.